Are you child-free, or do you have one, two or more adorable mini-mes? Are you in your first committed relationship, or third-time lucky? Be it two or forty-two years together, there's a lot to discover from Date Night. 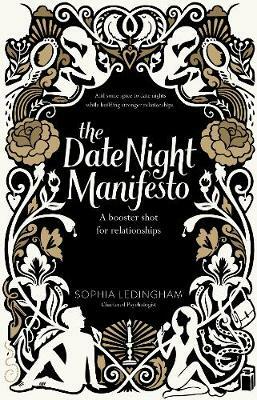 In her new book, The Date Night Manifesto, Sophia Ledingham chronicles Date Nights - hers and others - in upmarket and often fashionable places. Ranging from Hackney's Bistrotheque to Dublin's iconic Shelborne Hotel, to Amsterdam's infamous Supper Club, the author features some of the most desirable Date Night destinations. But setting, wherever yours might be, is only part of the solution. All kinds of couples love the enriched connection that comes from Date Night. Once the cloak of domesticity disappears, you'll find yourself revealing your romantic and attentive self. Using the Date Night Manifesto is a great way to discover new things about each other, even if you've been together for what feels like a lifetime. Whether you have clocked up double-digit anniversaries or are still savouring the wedding cake, the Manifesto's 16 principles will give you more to celebrate. The Date Night Manifesto will appeal to all couples, particularly those in established relationships, looking to reconnect, have fun and build stronger relationships. Sophia Ledingham is a psychologist who splits her time between London and Dubai. Much of her focus has been on improving relationships, whether it's in top-tier corporations or with couples and families. Something of a globetrotter, Sophia scans the restaurant scene for Date Night venues wherever she is. Sophia has been with her husband, who appears in the book as `Himself', for more than fifteen years.